I went to discover the town walking as usually, which is the best thing to do. But basically, you can do Hanoi in one day because the best thing to see is just the atmosphere and the urban life itself. Chill out with bia hoi Ha Noi at the central urban lake, quite nice. You might consider a historic day seeing Ho Chi Minh mummy, which is a strange feeling. You are walked through in a queue and see him from every side. This lasts about 3 minutes, but is very breathtaking. You can see where he lived and worked, his garage etc. Very interesting, and also the war museum was quite interesting I found. Started trekking straight away through the mountains passing many little huts from local tribes that are all wearing many-coloured clothes…I wondered that we saw other groups for lunch but not while hiking, and our tour guide (tiny many-coloured 21 year old girl) explained that we were about to do the more difficult parts because we were quite sporty. Indeed, I would never have gone where we went to, often, it just was no way, but climbing through rice fields, over stones and rivers, a buffalo on your left, wild pigs with their babies on your right. Next day was even better; we went deeper in the mountains. After rain, slippery everywhere, I ended up being completely muddy refreshing myself under the next waterfalls clothes and shoes included because they needed to be washed. Changing landscapes from rain forest to some panorama that could have been somewhere in Switzerland. Pure nature and such a nice air after sticky Hanoi. In the evening, another group stayed in our new home stay: a Czech couple and a Basque couple. Before getting to know each other, I had a refreshing bath again in the river between big stones and then in the hot springs. As one of my hobbies while travelling is to estimate where people come from by listening to their English accents or dialects, I explained to the girl from New Zealand that I thought the couple was Spanish. The guy heard that and shouted: no, not Spanish, Basque! I didn’t understand, I said, but you just spoke Spanish! He said, yes we are from Spain, but not Spanish, we are Basque! Okay, I understood, he was from Basque country in the North of Spain/South of France. The NZ girl didn’t quite get it and asked: what is the difference between being from Spain and being Spanish? He replied: well, we don’t want to be Spanish! We laughed about it and had quite interesting conversations that evening. Had a very hard day of trekking the last day in plain sun and came back to Sapa by jeep. My feet full of blisters and bloody, but happy. Strolling a bit through Sapa village and markets and drove back to Hanoi by night train. Next morning direction Halong Bay. Attention: many tourists are brought to Cat Ba Island doing some trekking but not entering Cat Ba National Park as indicated on the programme, so be careful: if you are not asked your ticket, you are probably anywhere but in the national park! Don’t book Vietnam Open Tours as operator. Flew to Hue in Central Vietnam and decided to try a guesthouse this time and not a hotel any more. Basically, the difference between guesthouses and hotels is that guesthouses have nicer rooms for cheaper rates and the showers are kind of self-efficient. There is no extra bath or shower tub but only a shower hose and you stand on bottom level more o r less closed to the toilet and washbowl. So you automatically clean the whole bath room when having a shower. Although the minibus driver tried to convince us of diverse other hotels on the way, got a 4 USD-room in a guesthouse recommended by Lonely Planet, which was more than okay for that money. And the manager more than nice, he really wanted to help. Or how Vietnamese people would put it: very carrying staff…(-: That evening, a Swiss guy told me his life. He got stock in Hue because he had fallen in love with a Vietnamese woman and now wants to leave Switzerland. Next day, eventually took a modoby including driver as things to visit are very wide-spread in Hue. Visited bunkers, pagodas, emperors’ tombs, the old imperial town and fortress, assisted a monk ceremony, went to a very old quarter which is very poor now but how you would imagine Vietnam before tourism arrived, passing hundreds of house boats on the river and in the canals, cute houses in the rain forest in the periphery – if your idea of Vietnam has got something to do with lotus flowers, many-coloured lampions, ding-dong-music, you will find it in Hue: many-coloured streets, calm and easy-going life, peaceful, much more relaxed than Hanoi or Halong Bay. Next day 9 hours train to Nha Trang watching Vietnamese TV: I was the only white person between only Vietnamese people. The little girl in front of me didn’t stop watching me (did you know that Vietnamese count their age from inception?). 4 hours in a local bus with only Vietnamese to Dalat listening to Vietnamese CD. Again very nice family-led guesthouse. I must say that the nicest people I found were on the country side, and they become nicer and nicer the more I drive to the South. In Dalat, I sat – again as only white person – in a street kitchen, two women sat down at the same table and were so happy to practice English that they bought typical Vietnamese food for me to try. Don’t wanna know what it was. They were very nice and didn’t even smack! Vietnamese people are very natural people. Reset your social education to zero and you are ready for Vietnam. They don’t only smack, they naturally snuffle and snot. They have no natural discretion not to watch when it might be unpleasant for someone, they just watch. If they feel like touching, they touch. The guy behind me in the bus put always naturally one of his naked feet either on my rucksack or my arm. With other words: Vietnamese have no fear of contact. If there is something very important like someone thinks you should absolutely buy his stuff, they pick their finger into your arm and say “you!” If you are far away and don’t react it comes up to “youyouyouyou!! !” – easy for them to pronounce: in the same way they have integrated French into their syllable-driven language like ca fe = cafe = coffee, ga = garre = train station, so-co-la = chocolat = chocolate. Uups, she did it again…yes I was really lucky with the weather for kite-surfing! Not only was there wind during a no-wind-season, the wind was even great for non-professionals, so I made good progresses. In fact I thought I would have forgotten more since a year ago in El Yaque. Compared to Isla Margarita, Kite-surfing is followed by beach-massage in Vietnam. Besides, lived from watermelon juice, fresh coconuts and spicy seafood (the food gets more and more spicy the further South I went in Vietnam, in the North they cook rather Chinese style, in the centre refined), acted as a kite-lesson-translator for a German couple, played billiard with 3 English people the first evening and went to the beach bar with the German couple the second night. Bought fake Billabong shorts (on two of them they had put at least a fake name, too: Buddabong) and had a chat with one of the boat people, while wandering around, who had to escape from Vietnam after the war and is now living in Canada. I was staying in the house of a lovely, elderly, grey-haired lady. Don’t ask me how I got there, she talked to me on the street, and I don’t know why I reacted (I’m usually quite reserved when travelling on my own), but I did. And it’s fantastic, have to go through her house to get to my room, it’s much cosier. Went to the war tunnels of Cu Chi, which is a huge labyrinth of tunnels in the bush reaching from just behind Saigon up to the Cambodian border. Impressive, scaring, calming down…we went down into these tiny tunnels, and even though they had been enlarged especially for Western bums, it was small and no light at all and sticky – you shouldn’t go in there if you suffer from claustrophobia. People were allowed to shoot with M14’s which gave a strange ambiance to the place. You can also still see the bomb craters. Ate the root “casaba” (Manioc) dipped in a mixture of salt, sugar and peanuts. Good! That’s what people used to eat while living in these tunnels for weeks. Afterwards war museum in Saigon (horrible, but very good) and Reunification Palace (had a free guided tour on my own with a very nice Vietnamese girl), so a day of history. Dinner and party with 2 Australians, 2 Swedish, 1 Swiss. …called “9 Drago ns” in Vietnamese. This is kind of a rural Venice with coconut palms in tropical climate. Only in this place they produce more rice than consumed in Vietnam (and that’s a lot) because they have 3 crops a year instead of 2 as usual. Maaany canals where we cruised with boats that became smaller and smaller the less we were in the group, so it was the best decision to book 2 days (1 day-tourists obviously disappear after half a day, 3 days is too long, though). 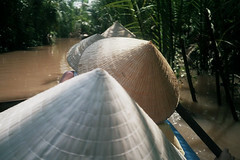 On the way, people here and there shampooing themselves in the river – clothes included – again Vietnamese efficiency. Slept in a bamboo house, and the way to get there was even more interesting. Just a bit rat poo-poo on the bed, but that’s alright. Had elephant ear fish (called like that because of its movements) for dinner that was rolled into rice-paper with salad, cucumber and rice noodles. Delicious! Chatted with 1 Australian and 1 English. The Vietnamese guy at whose house we stayed joint us. If Vietnamese people don’t possess anything, they have at least a TV: Vietnamese films on TV remind me of Bollywood films. Next day went to the floating markets which was really great. T he ones that know the floating markets in Bangkok said it was brilliant because no touristy boats at all selling souvenirs and just local and authentic, so I think it was THE time to go there! On their boats, all the things they are selling are hanging on a bamboo stick on top of the boat, like in a shop-window. Had Vietnamese style snake for lunch, came back to Saigon, last foot + body massage (max. 7 USD for 1.5 hours), last spicy seafood, end of my holidays in Vietnam. Sniff. Took the local bus no. 152 to the airport for 0.20 Eurocents. Backpacks are treated as an extra person. Only Vietnamese. They watched me, I watched them. What else could we do? This entry was posted in and tagged 9 Dragons, casaba, China Beach, Cu Chi, Da Nang, Dalat, floating markets, Hai Van Pass, Halong Bay, Hanoi, Hoi An, Hue, Marble Mountains, Mekong Delta, Mui Ne, Reunification Palace, Saigon, Sapa, Vietnam on January 23, 2009 by admin.